For Doctors who need help. Australian NZ Doctors in Recovery is a doctors’ mutual support group in recovery from addiction to alcohol and other substances. Dentists, vets and other health professionals with doctoral level qualifications are also welcome to join. We have a 12 step and abstinence focus, and are affiliated with International Doctors in AA. We aim to support each other in healthy living and medical practice free from addictive behaviours. ADR brochure 2019 available here. use code SOUTHBANK2019 when booking online directly with Mantra Southbank for preferential rates. 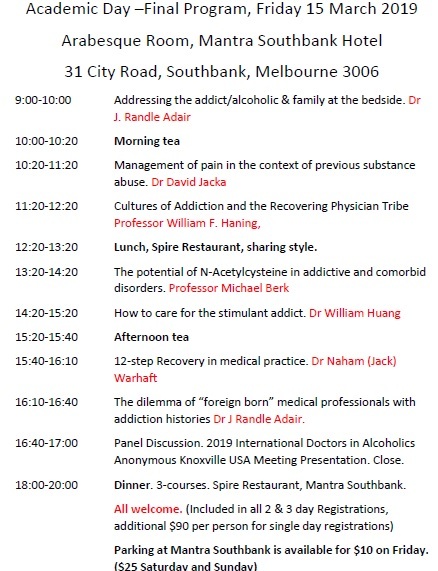 CME/Academic Day, Friday March 15, Arabesque Room, Mantra Hotel, Southbank. All Welcome. Speakers include Prof Bill Haning (USA), Prof Randle Adair (USA), Prof Michael Berk (Australia), Dr David Jacka (Australia), Dr Naham Warhaft (Australia), Dr William Huang (Australia). From Flinders Street Station, use western platform exits (i.e. Elizabeth Street end of the platforms), descending down the ramps, then turn left towards Yarra River. Cross the river on the pedestrian Evan Walker Bridge towards Southbank restaurants/shops and the Eureka Tower. As you exit bridge, you will see Pure South Restaurant (site of the Saturday dinner) on your left, and the looming Eureka Tower ahead on the right. Proceed south up Southgate Ave away from the river and towards City Road. 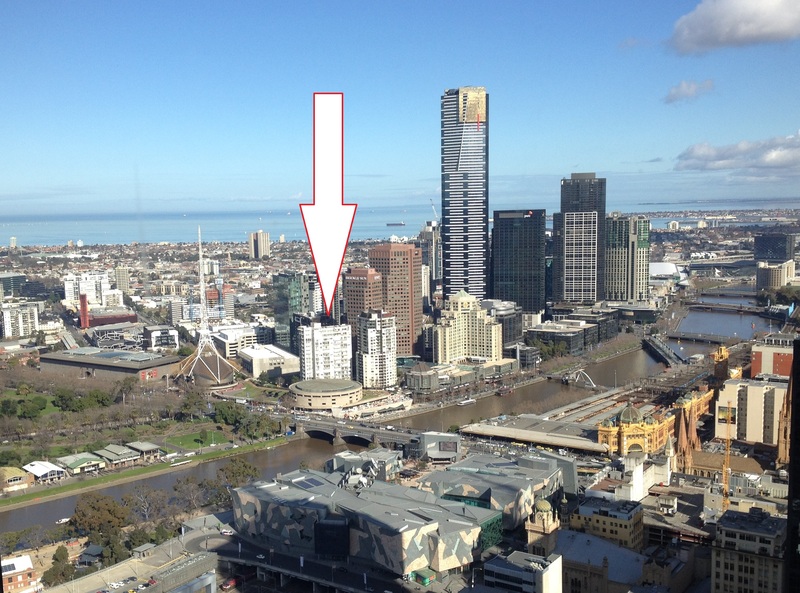 The Oaks Southbank hotel will be straight ahead. Use the pedestrian crossing to cross City Road and the Mantra will be to your left in the direction of the Arts Centre Spire. The walk from Flinders Street Station is 7-10 minutes. ADR Melbourne Walking Tour: A free activity on Thursday 14 March, leaving front of Mantra Southbank at 3:30 pm. 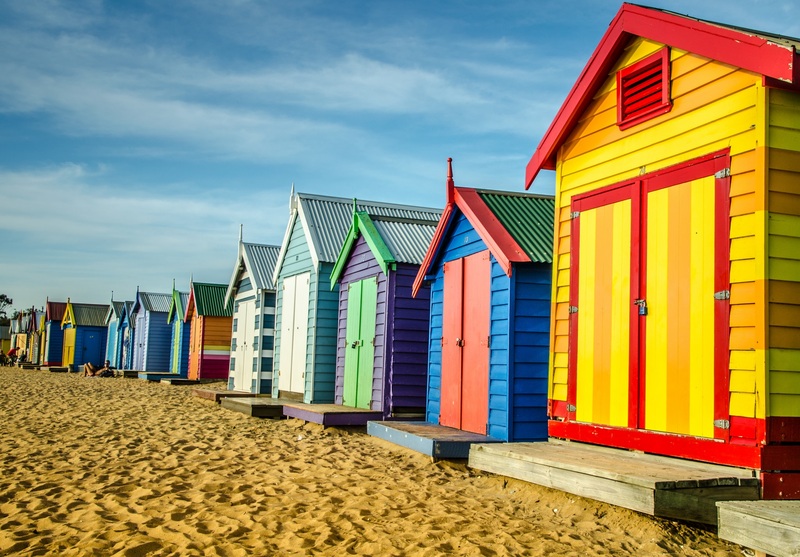 Join Ashley, a Melbourne local and convenor of this years’ ADR meeting as he takes you to sample a few of his favourite spots in Melbourne by foot. The nature and duration of the tour will be totally made up on the day. Depending on appetites and energy levels, we may end up finding somewhere to eat together on Thursday evening. For this tour, there’s no need to book. Just turn up. My mobile is 0419 793 036 if you need help finding us.